Across Southeast Asia, the holidays are a reminder of the many problems the region still faces. 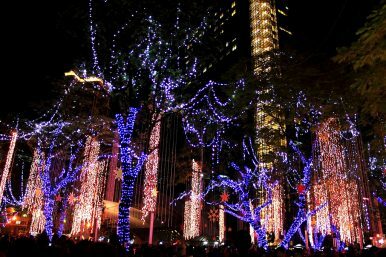 Across Southeast Asia, Christmas seems to be taking on bigger and brighter proportions. In Hanoi communist officials have extend their festive wishes to the church while Dreaming on Christmas Eve will go on stage at the Ho Chi Minh City Opera house. In Thailand, people are being urged to remember the late King Bhumibol Adulyadej by making a Christmas donation to his favorite charity the Soi Dog Foundation as his son readies himself for the job ahead as monarch. Meanwhile, Philippine President Rodrigo Duterte is urging rebels in the country’s much trouble south to take a Christmas vacation, while Cambodian Prime Minister Hun Sen is enjoying a truce with opposition leaders after a year of threats of war, imprisonment and defamation suits. The Christmas spirit seems to be encouraging amid calls for peace across the ASEAN landscape. Of course celebrations do vary from state to state, and appearances often diverge quite drastically from reality. In Indonesia, a Christian governor is under attack for blasphemy after making comments that upset the Islamic Defenders Front and left everyone else wondering what the fuss was all about. Malaysian authorities have quite rightly spoken out against the violence in Myanmar leveled against Muslims but have stood silent for years as Islamic hardliners demanded a ban on Christians from using words like “Allah” in-country. In 2009, some authorities tried to enforce a ban on Christians using the word “Allah” despite the word had being used in local bibles and dictionaries for centuries. In the aftermath, pigs’ heads were left at the entrance to several mosques but this was widely believed to have been staged by troublemakers hoping to blame Christians. Pig meat is non-halal and the heads had been wrapped in plastic bags, indicating they were not handled by Christians. In Brunei, the “War Against Christmas” (WAC) is being keenly watched after it was effectively banned last year with warnings that the singing of carols could threaten the country’s Muslim faithful. Vietnam has upset many with its willful blindness of international norms when it passed laws last month to augment the management of religion in country, where provincial authorities are notorious for their oppression of people of faith. Apart from the Philippines, all other countries in the region are predominantly Muslim or Buddhist. But even in Christian Manila any spirit of goodwill is far from convincing. Duterte is responsible for the slaughter of almost 6,000 people authorities labelled as drug dealers, indicative of what he really thinks of a judicial system he inherited, one which is even incapable of trying him for the murders of three men he confessed too. Not bad for a president whose approval rating stands at 63 percent – in the very good bracket – just one point lower than when he was elected to office with most Filipinos approving of the arbitrary killings and are apparently unfazed by his recent murder confessions. In Myanmar, ethnic Kachin are being displaced in a joyless Christmas in the country’s war torn north while Muslim Rohingya in Rakhine continue to be targeted for violent attacks, allegedly by the security forces, prompting an appeal from Cardinal Charles Maung Bo of Yangon. The cardinal’s thoughts are as wise as his words are noble. However, whether the region’s political leaders are up to the task is doubtful given their expertise at lip service when delivering messages of peace and hope in an often difficult part of the world. Nevertheless, despite the hypocritical nature of their leaders, many people in Southeast Asia would welcome such a start to 2017, which is already shaping-up as a very troubled year to come.